At the Down's Syndrome Vision Research Unit, we have been studying visual development in children with Down's syndrome since 1992. We have a large group of enthusiastic and highly committed families taking part in our studies, many of whom have been with us since the beginning, and we see over 100 children regularly. Our most significant findings are described below. Long-sight, short-sight and astigmatism are much more common in children with Down's syndrome than in typical children, and many more will need to wear glasses. Ordinary children are often long or short-sighted in early infancy, but grow out of these errors over the first few years of life. Children with Down's syndrome start out with a similar range of errors as do ordinary children, but are much less likely to outgrow the errors and much more likely to become more long or short-sighted. It is important (as for any child in the classroom) that the teacher understands when a child will need his/her glasses, and what level of vision he/she will have both with and without glasses. Long-sight of low to moderate degree can be overcome in typical children by accommodation (active focusing) and not all children who are long-sighted need glasses. However, children with Down's syndrome, because they have difficulty in focusing (see later), will be much more dependent on their glasses for clear comfortable vision than will typical children. Children who are short-sighted, on the other hand, may be better off without glasses for close work. 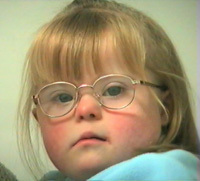 Children with Down's syndrome are at much greater risk of developing a squint (eye-turn) than are typical children. A child with a squint is likely to have a poorer level of binocular vision especially depth perception. 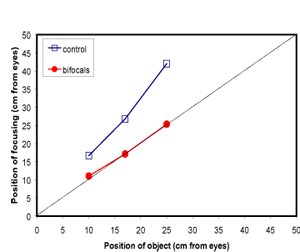 Tasks requiring fine depth discrimination, such as threading beads, will be more difficult. Children's interests are mostly close at hand, and most of children's learning takes place at near. And it is at near that we find the greatest differences between vision in children with Down's syndrome and typical children. Usually, children focus very easily and very accurately on near targets and it is only as we approach middle age that we expect to experience difficulty in focusing at near. 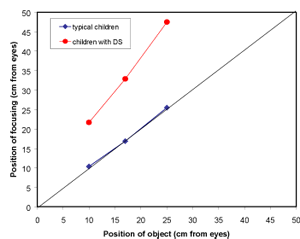 We find, however, that most (over 70%) children with Down's syndrome focus very poorly at near - they tend to under-accommodate by quite a large amount. This is consistent for any individual child, and persists even when the children wear their glasses to correct long sight. This means that near work, especially in school, must be more difficult for the children because it is out of focus. We don't yet know the reason for the poor focusing and we have studies underway to examine various possibilities. However, we do know that the children's focusing improves dramatically with bifocal spectacles. 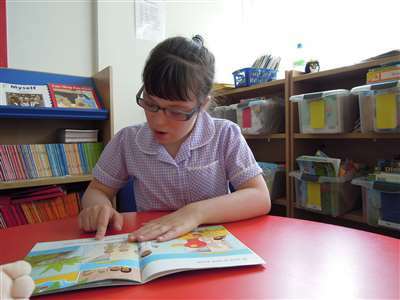 In a controlled trial, we supplied bifocals to a group of 17 primary school children with Down's syndrome, and conventional spectacles to a second group (the control group). The two groups were matched for all of the factors that might influence spectacle use or near work, such as age, cognitive ability, school placement etc. Over a 20 week trial, the children in the bifocal group consistently focused more accurately on near work than did the children in the control group. We find that children with Down's syndrome wear bifocals very successfully. None, so far, have encountered any problems, and several of the children prefer to wear their bifocals all of the time rather than keep them for school use. Two children were very reluctant to wear glasses when they had conventional ones, but now wear bifocals very happily. In some cases teachers and classroom assistants have reported improvement in concentration and quality of work when the children wear bifocals. We are now, therefore, recommending that all children with Down's syndrome who show poor focusing are prescribed bifocals. The positioning of the bifocal is very important. The top of the bifocal should lie across the child's pupil (this is a much higher position than usual for bifocals) so that the child can look down through the bifocal without effort. We provide an information leaflet that parents may take along to their child's eye examination; this specifies the correct position for the bifocal. Detail vision is usually measured in adults with the familiar letter chart. For children (and people of any age with learning disabilities) there are lots of alternatives that don't need reading skills. These include picture naming, matching or signing and the preferential looking tests that only require the child to look towards a picture or target. It is, therefore, possible to measure how well someone can see whatever the age and ability. At birth, detail vision is quite poor for all children, and rapidly develops over the first two to three years. 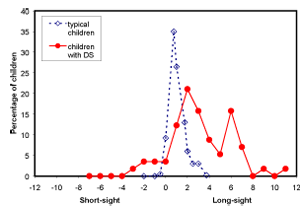 Acuity in children with Down's syndrome also improves in childhood, but it lags behind typical visual development at all but the youngest ages. The difference is the equivalent of perhaps two or three lines on a conventional letter chart at both distance and near, and is there even when children are wearing glasses that correct any long or short sight. The clinical ways of measuring acuity such as described above, using letters or pictures, are known as 'behavioural' tests because they measure aspects of a child's behaviour or performance as well as vision. One reason why we record a poorer visual acuity for children with Down's syndrome is that the children might under-perform on the test, not trying as hard when a test becomes difficult. Figure 5. a) Behavioural tests b) VEP acuity. In one of our latest studies we have measured acuity objectively using EEG techniques to record the brain's responses to visual targets (EEG's measured this way are known as visual evoked potentials or VEP's). We place small sensors on the child's scalp, kept in place with a trendy 'sports' band to record electrical activity (see photo below). Our data show that even with this technique, visual acuity is poorer in all children with Down's syndrome than it is in typical children. 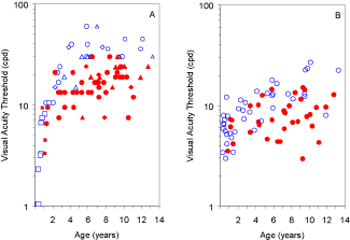 Our results show that acuity deficits are genuine and represent a (mild) visual impairment. It is important that teachers acknowledge that, even if children wear bifocals successfully, or if they focus accurately without spectacles, their visual acuity will still be below normal. Thus reading materials, for example, do NOT look the same to a child with Down's syndrome as they do to his/her classroom peers. The material does not appear to have the same level of detail. Enlarging the print may help the child to access print more easily, but does NOT restore a 'normal' appearance to the material. In similar studies, we have also shown that children with Down's syndrome are poorer at discriminating low contrasts and at detecting when a scene is out of focus. All of this may indicate that the children have a poorer ability in all visual discriminations than typical children. 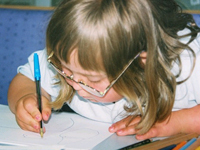 Visual tasks are therefore more difficult for children with Down's syndrome for reasons over and above any learning disability that they have. 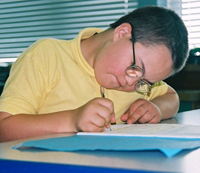 For this reason, we recommend that children with Down's syndrome are registered with their local education authority's visual impairment support service. A support teacher can advise the classroom teacher on whether materials are adequate. Blepharitis is an inflammation of the eye lash follicles that causes debris to collect along the margins of the eyelids and can cause irritation of the eyes. Children with Down's syndrome are particularly prone to this condition, which although not usually sight threatening, can be a source of discomfort and itching, and can result in scarring of the follicles and in-growing eyelashes. Blepharitis responds very well to simple treatment and parents should be encouraged to take their child to a local optometrist for advice. 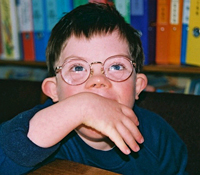 Children with Down's syndrome sometimes have problems finding glasses that fit well. In general, the children have smaller noses and a shorter distance from ears to face than typical children, and so glasses have a tendency to slip down. This is not only irritating for the child, but means that he or she isn't looking through the correct part of the lens. It is almost always possible (although time-consuming) for an optometrist/optician to adjust a frame, replace pads, shorten sides etc so that glasses fit properly. Children with Down's syndrome have as much right as other children to expect glasses that fit properly and comfortably without slipping. 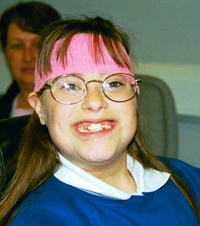 J. Margaret Woodhouse is at the Down's Syndrome Vision Research Unit, Cardiff University, UK.